Comments Off on James Brown Lives! I’ve just managed to catch up on my sumo, watching the video of last Sunday’s final day of matches from the Osaka tournament. They certainly saved the best for last: ozeki Harumafuji threw everything he had into a fierce bid to stop yokozuna Hakuho’s drive for a perfect 15-0 record in the final match of the basho. Hakuho prevailed in the end to take home the trophy in his first tournament as sole yokozuna, but I’m glad that I picked Harumafuji to win the bout in fantasy sumo anyhow. (It helps that I got my eighth victory and therefore a winning record for the tournament as a whole that day, despite my predicting an upset loss by Hakuho). The big story of the tournament, though, was sekiwake Baruto. Coming into the tournament, it was public knowledge that 13 or more wins would earn him promotion to ozeki, the sport’s second highest rank. He finished at 14-1, knocking off all the existing ozeki and losing only to the yokozuna. It was clear from the start that something had changed in Baruto: Estonian by birth and the first blonde to reach the top division in sumo, he has always had a charming disposition, his face frequently lighting up with a smile that reminded me of illustrations of gentle giants from childhood picture books. 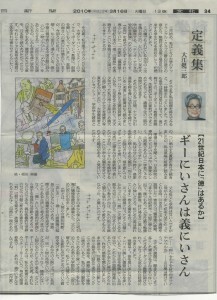 The goofy grin was gone in Osaka: Baruto showed a serious visage throughout, reflecting a new seriousness of purpose. He also unleashed an expanded range of techniques and remarkable power. I only saw him smile once the whole tournament: as he walked down the back corridors on the last day after Hakuho’s victory over Harumafuji had eliminated his title hopes. The promotion council will meet tomorrow to make Baruto’s promotion to ozeki official. I hope we continue to see the new serious Baruto in the coming tournaments–but I also hope we’ll see that smile again someday, as he holds up the trophy for his first tournament win. I suspect that will happen before the end of 2010. Yesterday we had a few minutes to kill downtown before my daughter’s orthodontist appointment. As we often do when faced with that situation, we stopped by my favorite public space in America: the Chicago Cultural Center. There, we took in two current exhibits, both quite fascinating–and, unfortunately, both slated to close later this week. “R&R (…&R)” is an exhibit of works by Susanne Slavick. She takes photographs of contemporary wartime destruction in Iraq, Afghanistan, and Lebanon and paints over them images from classical Islamic artwork, creating strikingly beautiful symbols of healing. One large panel, for instance, consisted of black-and-white photographs of bombed out cars, with colorful painted images of angels in the heavens pulling on ropes attached to the twisted hulks below. Slavick’s works give a sense of “restoration ” (one of the “R” words she has in mind in the exhibit title), and they also prod us toward a new awareness of our place in a global, millennial flow of history: I couldn’t help wondering how the images of our own violent times will look to human (or angelic) observers 500 years hence. The exhibit runs through April 4. You can see more of Slavick’s work here. In a neighboring gallery we found “Up is Down: Paintings by Joel Sheesley.” In sharp contrast to Slavick’s macroscopic take on human history, Sheesley uses a microscope: his paintings depict small puddles in his back yard, with each water surface transforming into a mirror that reflects upward: ladders, clouds, people. The detailed images are often achingly beautiful, as Sheesley opens up an almost infinite sense of joy and wonder in the most mundane of (literally) backyard phenomena. The exhibit runs through April 3. Sheesley’s website is here. The orthodontist appointment likewise turned out pretty well. I hope your Saturday morning brought you something splendid, as well–whether on a macroscopic or a microscopic scale. Spring is here (just watch this) and I’m ready to go. The Twins are going all the way this year, folks. All the way. Liriano and Neshek are back, Mauer and Morneau and Cuddyer and Kubel are ready to start popping the ball out of the park, and the starting rotation is the strongest Minnesota’s ever had. Sent a couple in their mid-forties to the San Diego Padres in exchange for Duane (Madman) Mueller (29, 280 lbs., 6’2”, right/right, a.k.a. Mule, Hired Hand, The Barber). Duane is a big secret because after he was suspended by the Texas League for throwing too hard he played Nicaraguan winter ball for three years and then spent two more doing humanitarian stuff, so scouts forgot how, back when he was with the Amarillo Compadres, nobody wanted to be behind the plate, Duane threw so hard. His own team kept yelling, “Not so hard, Man!” If that sounded dumb, then you never saw him throw: he threw hard. A devoted Lutheran, he never ever hit a batter, but in one game a pitch of his nicked the bill of a batting helmet and spun it so hard it burned off the man’s eyebrows. No serious injury, but big Duane took himself out of organized ball until he could learn an offspeed pitch. He’s from Brainerd, Minnesota, where he lives across the street from his folks. His mom played kittenball in the fifties and had a good arm but not like her son’s. She thinks he got it from delivering papers and whipping cake mix. “I’d sure hate to have to bat against him,” she says. I’m ready, man. Bring it on, folks, bring it on. Good morning from Philadelphia, where I arrived late last night to attend the Association for Asian Studies Annual Meeting. I perhaps should say that I’ve “returned” to Philadelphia, since I was here on Monday and Tuesday for the NCC-3D conference, a large gathering of librarians, scholars and others who are concerned with the state of Japanese library resources in North America. As always happens when I get together with librarians and other information science people, I was impressed with the knowledge, passion, and commitment they bring to their professions. It was also exciting to learn about new developments in the field–the progress, for example, of the digitization project at Japan’s National Diet Library. The other thing that became clear to me at the event, as it has at every recent scholarly event I’ve been to, is how much pressure everyone is facing in this time of slashed budgets, rising costs, and uncertainty about the future. These are challenging times for people who care about scholarship in North America–and in East Asia, too. Yesterday, I was up at Princeton participating in the Workshop on Postwar Literary Criticism, the initial event in an exciting new collaborative research project that brings together faculty and students from the University of Chicago, Princeton University, and Waseda University. On the morning panel, Toeda Hirokazu (Waseda) presented some very intriguing ideas about how we should bring in the issue of censorship when we rethink literary criticism from early postwar Japan. He’s one of the editors of a new series of books that collects Occupation-period censorship records, and in his talk he showed us some remarkable instances of the conditions under which Japanese writers and editors functioned in the late 1940s. Sakakibara Richi (Waseda) spoke on the 1946-7 “Politics and Literature” debate among leftist and Marxist critics, noting the implicit rise through the course of the debate of a series of shared concepts and keywords among participants who seemingly agreed about nothing. She also traced through how those same concepts and keywords meant something very different for the participants in the debate from what they mean today. 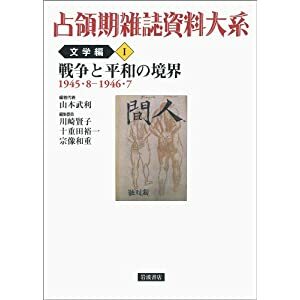 I spoke about the same “Politics and Literature” debate as an early instance of Cold War culture, situating the works of such Japanese critics as Hirano Ken, Ara Masahito, and Nakano Shigeharu alongside that of some of their contemporaries in North America. In the afternoon, we had some excellent suggestions for the papers and projects from two discussants, Victor Koschmann (Cornell) and Richard Calichman (City University of New York). Then we had another terrific session in which graduate students from the three schools presented their thoughts about how to translate and annotate texts from early postwar literary criticism in ways that will address a variety of different kinds of readers. The joint research project is off to an exciting start. We’ll bring the group together again for another workshop in Tokyo at Waseda this summer and then wrap things up with a formal international conference at Chicago next year. It’s the sort of project that makes you feel hopeful for the future, despite all the bad news about budgets that plague academic life in both Japan and North America these days. The agenda for today is to carry out some sightseeing in Philadelphia with my daughter and to catch a panel at AAS tonight. Tomorrow morning I’ll visit another panel or two, visit the publishers’ exhibition hall to say hello to some editors I work with, and we’ll be on a plane back to Chicago tomorrow afternoon. Finally, say “happy birthday” to one of my childhood heroes. I’m going to have check out that new DVD set…. The sumo tournament in Osaka has reached the midway point, and as expected sole yokozuna Hakuho (7-0) has dominated. But two promising rikishi have also stepped up to take advantage of the opening created by yokozuna Asashoryu’s sudden retirement last month: ozeki Harumafuji, the former Ama and a disappointment since his promotion to ozeki a couple of years back, is now 7-0, as is sekiwake Baruto, who could win promotion to ozeki with a championship in this tournament. Baruto in particular has been impressive: he just looks much more serious about things this time around, his goofy grin a thing of the past. Down in the maegashira ranks, Tokitenku is also 7-0, but that’s just a bunch of smoke and mirrors. In the meanwhile, spring has arrived in Chicago (never mind those snowflakes falling outside the window as I write these words). I celebrate by listening to Minnesota Twins spring training games in the afternoon at my office. I’m pretty optimistic about the coming season, despite noises being made by local White Sox fans…. In the category, “It’s bloody well about time”: Universal betting on lower prices to boost CD sales. The coming week should be a hectic one for me. I’m in Philadelphia on Monday and Tuesday for the NCC 3D conference, then up to Princeton for the “Rethinking ‘Hihyo’: Postwar Literary Criticism and Beyond” workshop, then back down to Philadelphia on Thursday for the 2010 AAS Annual Meeting. I leave you with the late Alex Chilton. I saw him play with the reunited Big Star seven or eight years ago at Royce Hall on the UCLA campus. It was a joyous occasion, especially when they covered The Kinks’ “‘Till the End of the Day.” Ray Davies dedicated that song to Chilton in his performance at SXSW this week (where Chilton had been scheduled to play) and spoke from the stage about how Chilton had visited him in the hospital after he was shot in New Orleans. A great songwriter and a wonderful voice: so long, Mr. Chilton. 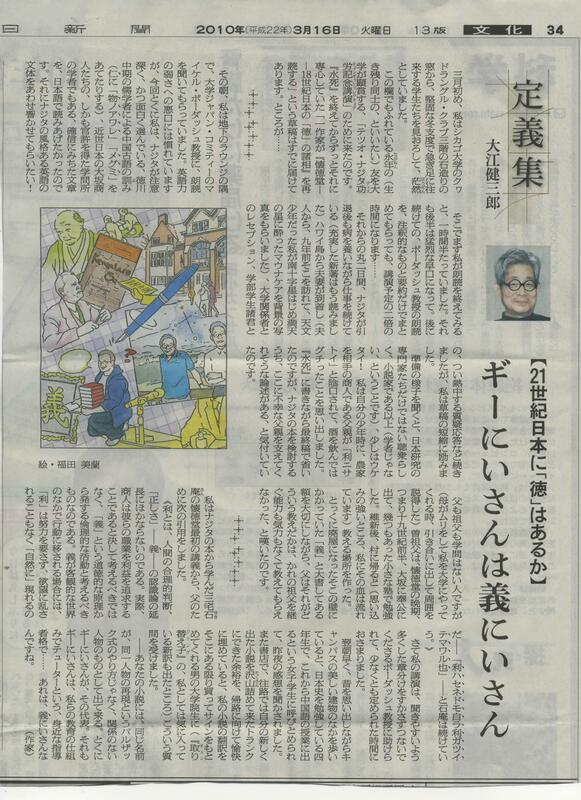 Here’s a scan of a very nice column (Japanese-language only) that Oe Kenzaburo published in yesterday’s Asahi newspaper about his visit last week to the University of Chicago. (Click on the image to get a larger version). Granted, this may be taking my Kinks mania in an entirely unhealthy direction, but just check out the shoes Ray wore at his gig in Kansas City last night (full review of the show here). I thought it was pretty cool when for my birthday last year my wife and daughter finally gave me those Converse low-top black sneakers I’d been lusting after forever and ever, but after this they seem pretty small potatoes. It was a terrific show last night, powerful enough to sweep away any lingering mental and spiritual cobwebs. It was, in short, just what I needed. After a spirited opening set by LA band The 88, Ray took the stage with his accompanist, Bill Shanley, and opened with the wistful “This is Where I Belong.” He followed up immediately with the acoustic blues version of “You Really Got Me” that he developed for The Storyteller show, the number morphing halfway through into “I Need You,” and we were off and running. He asked the audience how they were feeling and then added, “Do you want to know how I’m feeling?,” whereupon he burst into song: “Well, baby, I feel good” (“‘Till The End of the Day”). He played tunes from all stages of his career, including early (“Too Much on My Mind,” “Everybody’s Gonna Be Happy,” “Where Have All the Good Times Gone?,” “Sunny Afternoon,” “I’m Not Like Everybody Else,” “See My Friends,” “Dedicated Follower of Fashion,” “Tired of Waiting”), mid (“Two Sisters,” “Victoria,” “Apeman,” “Twentieth Century Man”), late (“The Hard Way”) and solo (“In A Moment,” “The Tourist”). Highlights included two songs I’d never heard live before, “Nothin’ in This World (Can Stop Me Worryin’ ‘Bout That Girl)” and “Postcard from London.” The latter, released just a few months ago as a duet with Chrissie Hynde, worked remarkably well in the stripped down version Ray performed. We were also treated to Ray singing a verse of “A Well Respected Man” in his best Johnny Cash voice, as well as his imitations of David Letterman (so-so) and Paul Schaffer (pretty good), and a touch of an Irish folksong in honor of St. Patrick’s Day–Shanley played brilliantly on this and everything else through the evening. A high energy version of “All Day and All of the Night” closed the acoustic portion of the show. Ray was in fine voice and seemed in good spirits throughout. For this Kinks’ fan, it’s been gratifying these past few years to see him relax and simply enjoy the respect and adulation he’s earned. The 88 returned to the stage to back Ray for a powerful final set that lit the joint on fire: “You Really Got Me” (reprised with heavy guitars and drums), “David Watts,” “Celluloid Heroes,” “Dead End Street,” “Low Budget,” and finally “Lola.” After playing most of the show from a sitting position, during the closing set Ray was jumping up and down and racing across the stage, looking nothing at all like a 65-year-old senior citizen. The crowd was a typical Ray/Kinks mixture: young ‘uns in their twenties, gray hairs in their seventies (some literally with canes), and everything in between. I rode the Red Line El train home with a big grin on my face. For the umpteenth time, I’d participated in the big communal singalong on the chorus to “Lola”: that’s the closest thing there is to a religious ritual in my life. On the dark side, tomorrow we take our first step into that gray new world known as post-Asashoryu sumo. Yokozuna Hakuho is the prohibitive favorite to take home the title in Osaka (has it really been a year since I was there in person for Day 8 last March, watching Asashoryu knock off Baruto in a fierce match?). Ozeki Kotooshu seems the only possible threat to Hakuho’s championship, and if there’s one thing we’ve learned about Kotooshu over the years, it’s that he shrinks like a banana souffle anytime he gets close to something good. Perhaps his recent marriage will change things, but my money’s on Hakuho (ho-hum: the subtle sound of a middle-aged man yawning). Even darker, this is the week we learned the Minnesota Twins may have to live without relief ace, Joe Nathan. There are some viable replacement candidates already on the roster, including the marvelous Pat Neshek, back after an injury-related break of nearly two years, and Francisco Liriano has been tantalizingly good so far. But the loss of Nathan has Twins’ fans literally offering up parts of their own bodies in hopes of resuscitating Nathan’s pitching arm.